Pick your ultimate aquamarine tiara! Aquamarine might not be the first material you associate with tiaras, but there are actually quite a few aquamarine examples out there. And they're prevalent enough in today's royal collections to earn a spot in yours. The collective British royal family has the largest array of tiaras of all the royal families, so it's no surprise they outnumber in the aquamarine category. 1. The Brazilian Aquamarine Tiara, the only aqua tiara worn by the Queen these days. 2. The Wessex Aquamarine Tiara, a convertible necklace which is thought to be the Countess' personal property. 3. 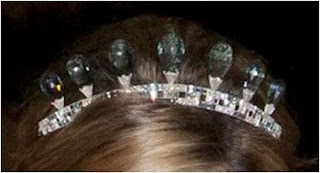 The Five Aquamarine Tiara, previously worn by the Queen and now worn by the Countess of Wessex. 4. The Fouquet Aquamarine Tiara was originally a kokoshnik, and now simply has its motifs on a frame. It combines aquamarines, diamonds, and pearls, and has been worn by the Duchess of Kent. 5. The Aquamarine Pineflower Tiara, a curious motif to render in aquamarine, I think. Worn by the Princess Royal now. Sweden has a few additions, the Swedish Aquamarine Kokoshnik Tiara from Princess Margaretha, and the small bandeau tiara which originally came from Queen Louise and is best known as Princess Madeleine's first tiara. The Dutch are represented by the Art Deco aquamarine tiara which originally belonged to Queen Juliana and is now worn by multiple royal ladies. In Luxembourg, there's an Art Deco set of aquamarines and diamonds with a bandeau tiara. Princess Sibilla has worn the current version of Queen Victoria Eugenia's Aquamarine Tiara, which sort of doubles as a Spanish entry here. From Belgium, Queen Fabiola's convertible Spanish Wedding Gift Tiara is most often worn in its aquamarine version. Left: a Cartier aigrette tiara auctioned from the collection of Olga, Princess Paley, Countess Hohenfelsen in recent years. Right: The Hesse Aquamarine Tiara, once owned by Grand Duchess Elizabeth Feodorovna of Russia. It and its matching set, earrings plus a necklace and bracelet by Faberge, were sold in 1996 by Princess Dorothea of Hesse. Left: A Russian aquamarine kokoshnik said to have belonged to Empress Alexandra Feodorovna. Its whereabouts are currently unknown. 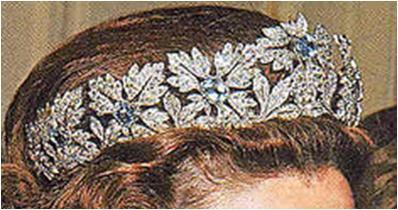 Right: The Ligne Aquamarine Tiara, best known for being worn by Isabella Orsini on her wedding day. 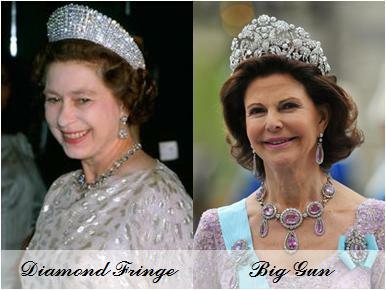 Left: An aquamarine tiara auctioned from the collection of Christian, Lady Hesketh. Right: An Art Deco tiara made by Cartier in 1937 in the run up to the coronation of George VI. UPDATE: Thank you for your votes, voting is now closed!